The Ediacara biota diversifies in the expanding shallow seas. These thin soft-bodied animals include early forms of polyps, medusas and sponges – and some hardly classifiable organisms. Southern Finland is partially covered by sea. After the glaciations, multicellular animals became common in the shallow seas. The Ediacaran animals had soft tissues, and many of them where flat sessile animals, which fed on food particles in water. Their sizes varied from a few millimetres to two metres. Many of them were structurally similar to modern polyps, medusa and sponges. There were possibly also some bilateral animals, but these are very poorly known. It is likely that biota was in fact more diverse, because organisms without hard parts do not fossilize easily. Earliest clear fossile evidences for multicellular animals are from this period. 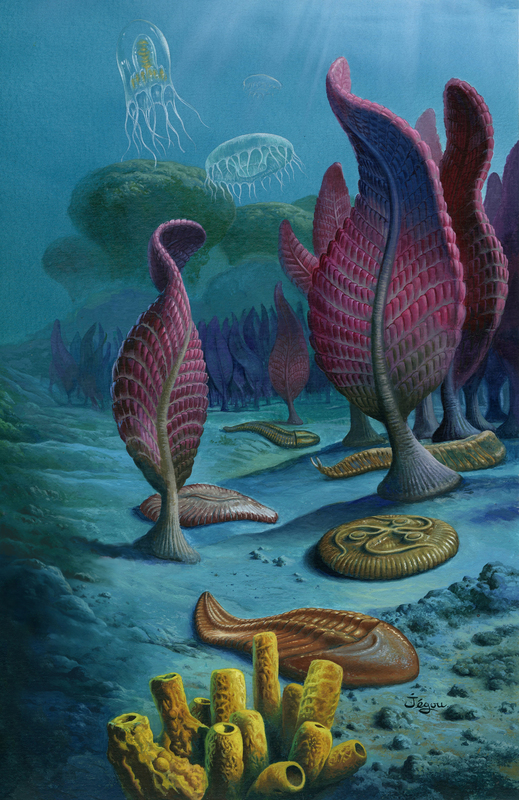 The Ediacaran period was the beginning of animal evolution, which was accelerated by the increasing oxygen content. The first fossils from Ediacaran period were found in Australia in the Ediacara Hills, during the 1940s. Species from this period can be found from nearly all continents. Most of the species lived in shallow seas, although some fossils in Newfoundland where from deep-sea environment.